NORWALK — Amy Traore walked onto the Springwood Park tennis courts four years ago as an 11-year-old middle schooler with no knowledge of the sport. Today, at 14, Traore serves as a coach at the courts, teaching kids how to swing rackets and where they should hit the ball. For her, the experience has been both educational and something to keep her busy during the hot summer months when school lets out and all the classwork and activities that come along with it come to a standstill. The Junior Coach program, with funding from a variety of organizations including the Mayor’s Summer Youth Employment Program and Bridgeport YouthWorks Program, is a part of comprehensive year-round programming Grassroots offers. There is also a summer camp for younger kids and the start to a program for middle school-aged youth. For the Junior Coach program, Grassroots hires qualified students from local high schools based on grades, leadership availability, tennis and other skills. Beyond their paid work with younger kids on the tennis courts, they learn leadership skills, the ins-and-outs of navigating a first job and partake in tutoring sessions to work on summer school work. Grassroots also offer open court times from 10 a.m. to noon Monday through Friday, where junior coaches and full coaches are on site to help and supervise any kids from across the city that want to come to play. For the younger kids, age 5 to 12, Grassroots also holds a more formal six-week Summer Education and Enrichment Program, set to run this year from July 5 to August 16. Priority for registration is given to the kids who partake in Grassroots’ program year-round, but they open it up to the community as well accepting a maximum of 40 students. Grassroots is looking to service middle school kids as well for the first time this year, as leaders there noticed they were “starting to fall through the cracks” between the other opportunities. To fill that gap, Grassroots is partnering with community volunteers to provide curriculum to those students this summer once or twice a week in the form of fun curriculum based around topics such as entrepreneurship. finances and budgeting. All of the programs are free for the kids. The only requirements are that they qualify for free or reduced lunch. Even supplies such as rackets, balls and uniforms are supplied by Grassroots. 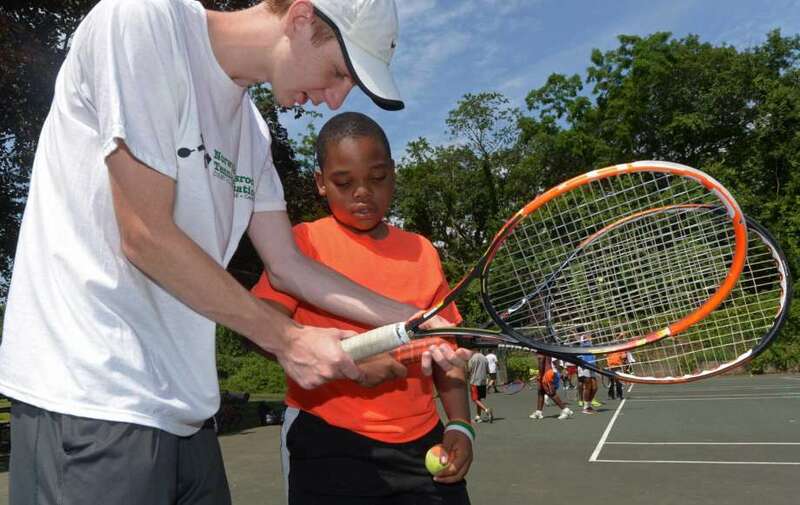 David Kimani, director of tennis for Grassroots, said keeping kids engaged during the summer through tennis teaches them much more than just the sport. To Traore, who worked her way up from a youngster in the program to a Junior Coach, it has taught her responsibility, independence, time management and how to speak to the young people she works with regularly. All this from a sport she fell in love with due to its ease of access.